VR Multiplayer games are now possible with Xtreme Multiplayer Pack! Do you like network games and virtual reality? Now imagine that we combined them to create really exciting entertainment! 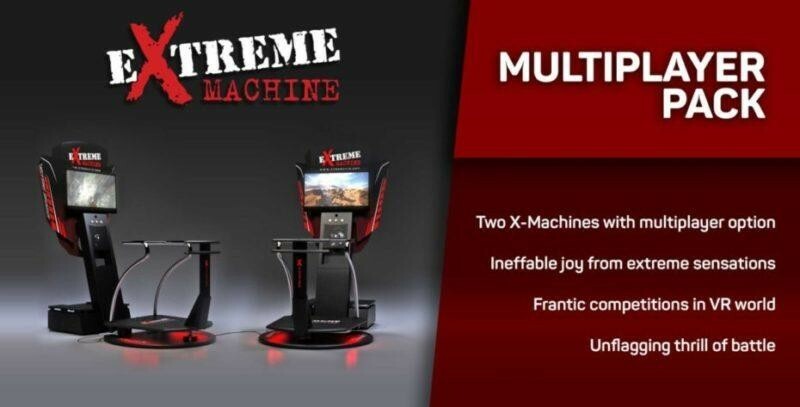 No one can stay indifferent to our extreme VR Simulator X-Machine! Players just stick in our hyper realistic worlds of extreme adventures. We are happy to introduce you Xtreme Multiplayer Pack that includes TWO X-Machine virtual reality simulators with a set of 10 best games with multiplayer control from Dreampix Studio! Want to attach more machines? Xtreme Multiplayer Pack allows you to connect from 2 to 10 virtual attractions! Now remember how you were a teenager and spent all your pocket money in arcade zones of entertainment centers! Xtreme Multiplayer Pack will bring you back to those times – players can choose any game that they like and get sucked into VR machines with their friends. Any VR machine is always surrounded with the same atmosphere: one person is playing, screaming and having fun while his friends are just watching and waiting for their turn to ride. With Xtreme Multiplayer Pack we found a solution: the user can be wrapped up in VR with his friends and not only explore the universe of virtual reality but also fight with each other and prove who is faster, stronger and braver! You can start your own VR business and create a VR amusement park with X-Machines because all our games are unique with different mechanics, control mechanism and storylines. Xtreme Multiplayer Pack will be a true magnet for hot-tempered players: wishing to show who is the best in racing and shooting, they will spend plenty of time in VR. All our videos are extremely realistic and developed in such a way that you feel all rises, falls and turns very naturally like it is happening in a real life. As a result – adrenalin is rising and in combination with passion from the race we have a perfect VR attraction! Do you want to talk to your partner while playing? No problem! Our system supports audio connection between players so they can communicate with each other!